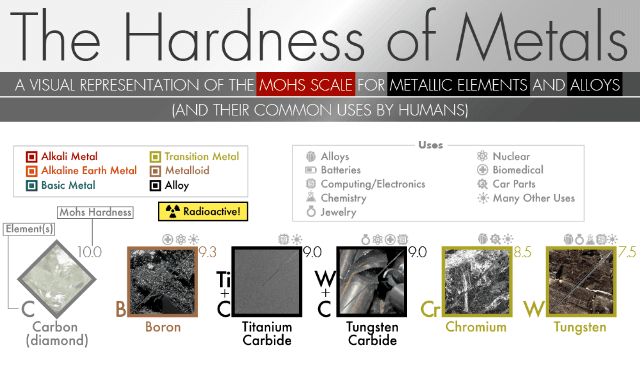 The Hardest Metals and Softest Metals: A Visual Representation of the Mohs Scale #Infographic ~ Visualistan '+g+"
How hard are the world’s most common metals? We’ve created a chart that breaks down data on the hardness of metals from the periodic table and beyond! From liquid-like Mercury to the super-tough Tungsten Carbide, commonly found metals on this planet have a huge range in terms of strength. We used the Mohs scale for mineral hardness, which essentially means how deeply a diamond (which is a 10, the highest number on the scale) could scratch into its surface. It’s the most popular of several indicators of hardness, and not necessarily a rank of toughness, which has its own scale. Hard and malleable metal alloys like bronze and brass has helped humanity develop tools, weapons, and create civilizations. Now, super-soft metals are essential for modern chip technologies. We listed some of humanity’s most common uses for each metal in addition to its hardness. Check out this quick picture from AlansFactoryOutlet.com of the different metals of the earth, how humans have used them over the years, and how hard they are!